This cover of the Bangles’ “Walk Like An Egyptian” probably doesn’t have much appeal to the smoking jacket and brandy snifter crowd, but to me it’s high art. I hope you enjoy it. Jeff, KE9V, over at Signal & Noise broke the news about the Vibrocube, a hefty new key from Vibroplex. Weighing in at six pounds this paddle shouldn’t be flying across the desk. 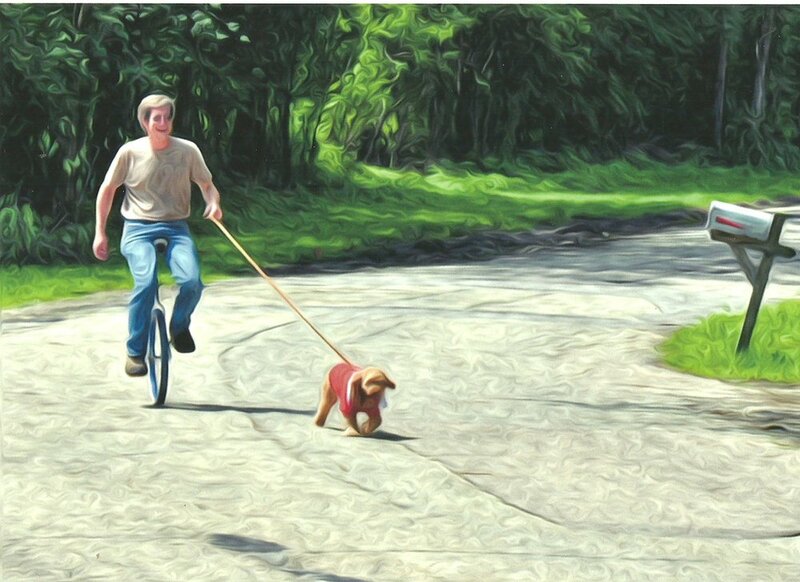 Looking at the picture reminded me of a post Mike, W8MDE, had made a while back at his web presence “Recumbent Conspiracy Theorist” . the modern name plate. Interesting comments from the CW community follow his post. As a radio ham regular civilians sometimes say to me “You get the REAL news.” I usually squint my eyes and nod knowingly. Of course more and more I’m finding myself in QSO’s where I get in line to send my call sign, hear the response “AB9NZ 5NN TU” and the send back “5NN TNX dit dit”. On it’s face this seems rather unsatisfying, that is until you consider what went into that exchange of signal reports. Seasoned operators, masters of the telegraphic code, travel to the farthest reaches of the globe, endure great expense, hardships, and even danger and occassionally loss of life, just to activate radio stations for our pleasure. At my end there was a little work too, building a station, learning the protocols, and actually achieving a small semblance of Morse proficiency. I can’t think of another hobby where eternal signals are created, where one can witness the speed of light, and where a fella can feel the sheer joy of actually dabbling in the supernatural. To me, a quick handshake from some remote outpost, traveling through thousands of miles of aether, is a pleasure and privilige that just shouldn’t be denied. The notion of a ham band where Morse telegraphy isn’t allowed is the kind of sillyness that will soon be relegated to the tar pits. Our League has lobbied the FCC and won some changes to the five megacycle band allowing higher power, CW, and even transmitting modem noise on 60 meters. You can read about these changes here . My radio will require a small modification to allow transmitting in this newest of ham bands. Removing a diode in the Icom 718 will allow wide transmit from 1.6 to 30 mhz. The hard work and dedication of the ARRL staff and volunteers is truly appreciated here at the Radiotelegrapher. Last night Dorothy was rather despondent over a whole bunch of her work that became trapped on a broken thumb drive, but needless to say, waking up next to a licensed radio amateur has it’s advantages. 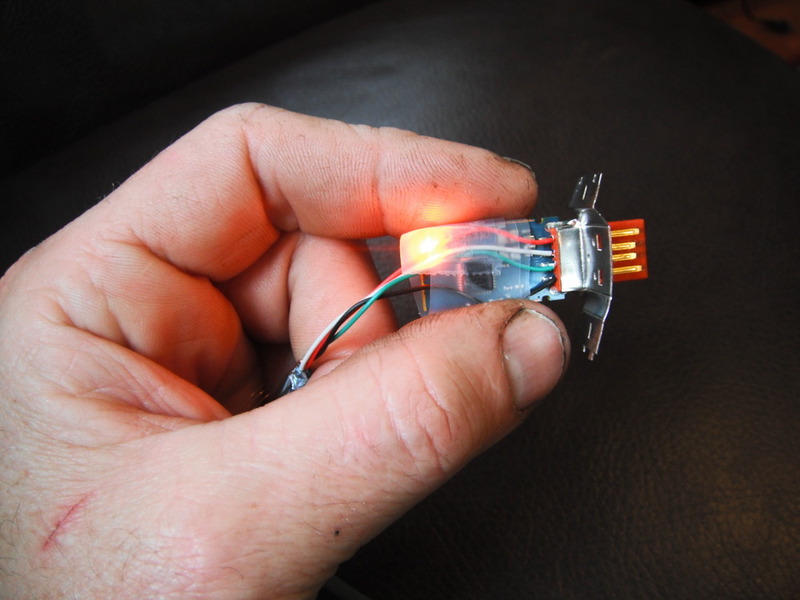 I found the USB pin-out online, and was then able to trickle the 1.42 gigabytes of data out through a set of jumpers I cobbled together to burn her school work to a disc. Another day saved. 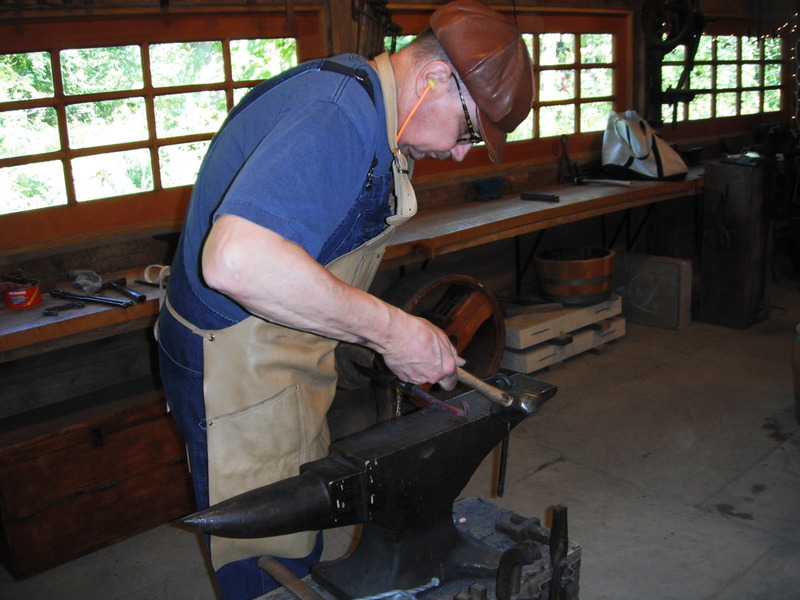 Last Saturday I took a blacksmithing class at The Grove National Historic Landmark. I arrived early and met Bob, the instructor, (hard at work forging a scroll in this picture). As we talked, needless to say, I steered the conversation toward ham radio. That’s when Bob dropped a bomb. He told me he was waiting for his call sign to show up on the FCC website. A few hours after the class KC9UTL showed up on the database. Welcome aboard Bob. Dorothy works very hard on the garden at our little cottage, so with the leaves begining to turn, I wanted to be sure to post a picture of the garden in it’s full glory. [[posterous-content:pid___1]] When we visited the Wawel castle in Krakow Poland a few years ago we got caught in a downpour in the courtyard. At each corner dragon shaped downspouts gushed water. After seeing them, Dorothy requested dragon spouts for our house. After building our front porch I hammered these out of copper sheet, and soldered them together. Now when it rains our dragons spit water. Click on the pictures for a closer look. Never one to flail at life with alligator arms, when my little brother John (KC9LGM) decided he needed a walking beam engine he built one. This wasn’t a kit. He made wooden patterns for the parts, made sand molds from the patterns, and poured aluminum melted in his backyard foundry into the molds. He then finish machined the parts and assembled the engine. Way cool! This morning I worked the station FP/VE2XB on 17 meters. Mike was skillfully running a nice pile-up, so I didn’t try to ragchew the DX. After a quick exchange I signed and was left in a quandary, FP? 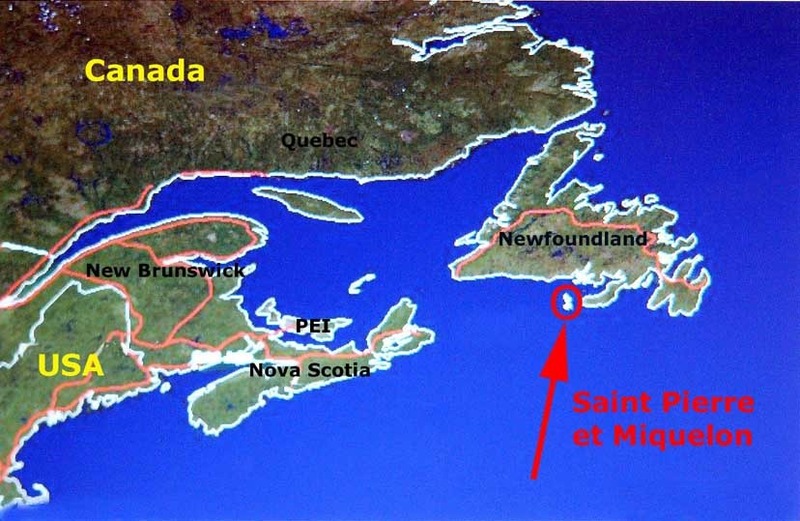 Through the magic of the internet I learned that FP is the prefix for St. Pierre and Miquenol Islands. What surprised me was that this is actually a territory of France, located at the end of a string of islands off Newfoundland. Wikipedia has a nice write up about it, describing it’s colonization since the 17th century, and that during World War II Canada even considered invading it! I don’t know how I got mixed up with you guys, but this ham radio sure is taking me a lot of places.